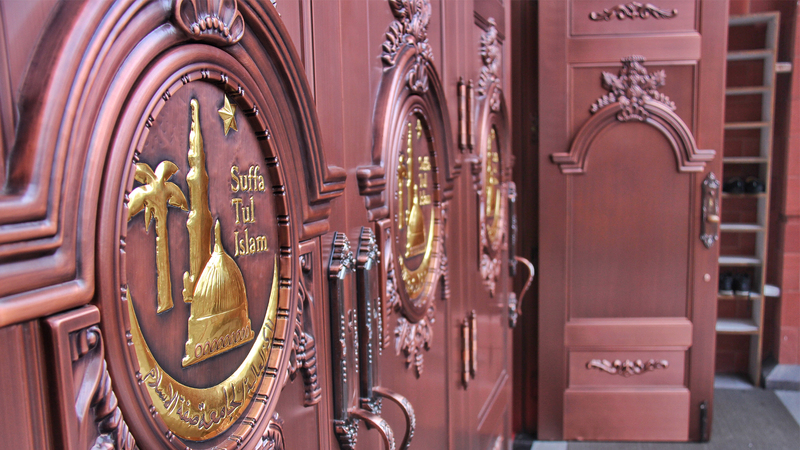 An angle of the main doors through which fellow worshippers enter the masjid. 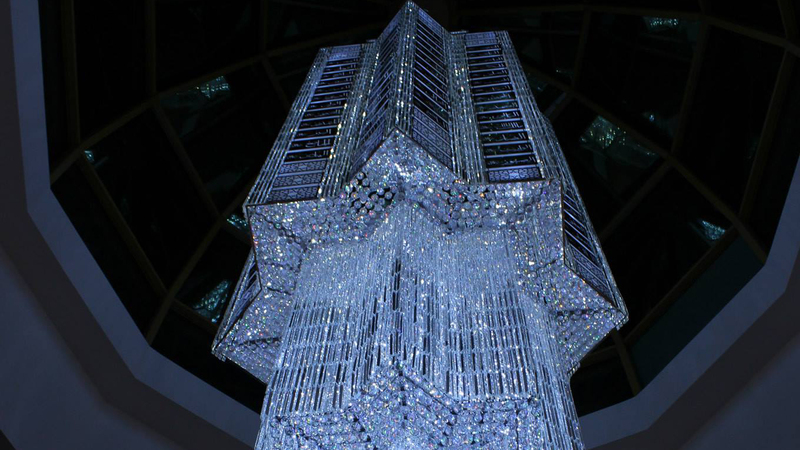 Here you see a shot of the bottom tier of the chandelier located in the foyer area. 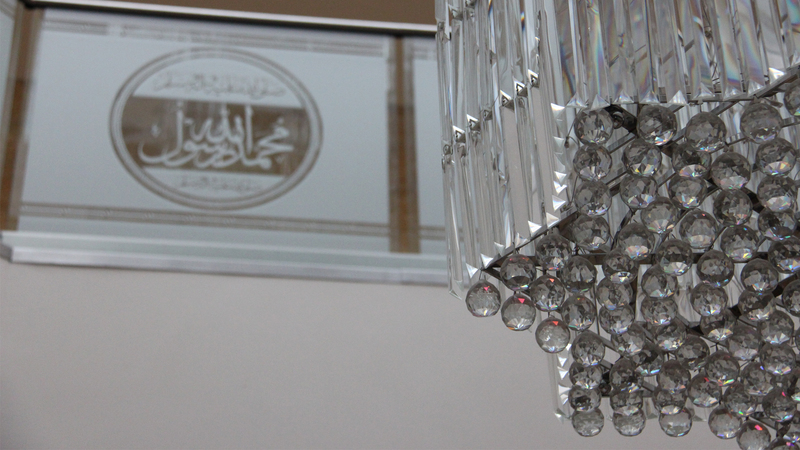 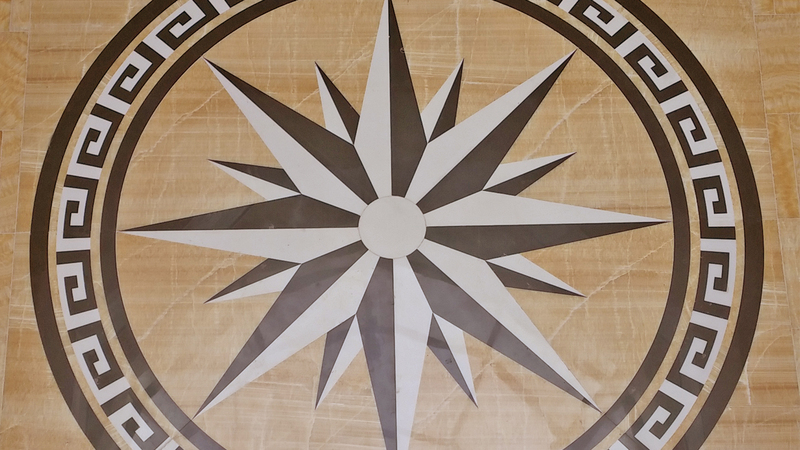 Elegantly finished, each area of the masjid is touched with a range of facets to capture your attention. 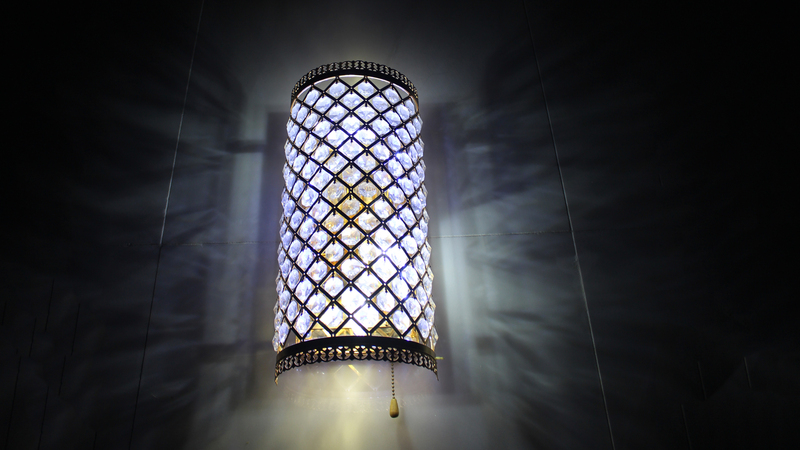 Lights hung from the walls of the grand mosque. 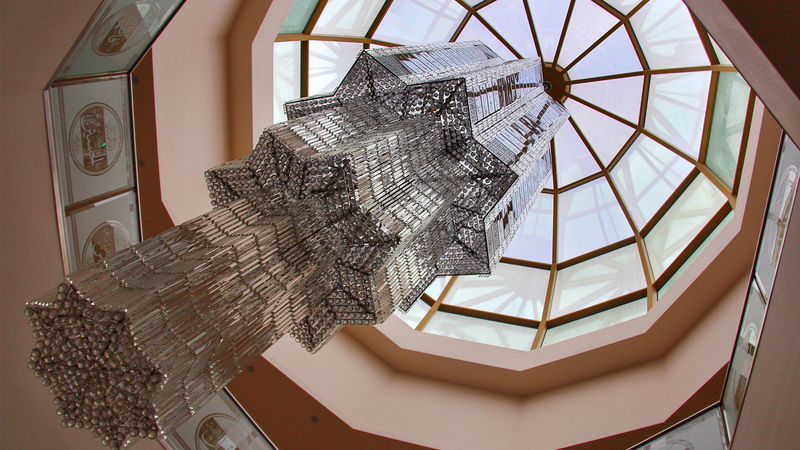 An upwards-looking vertical shot of the chandelier installed in the foyer area. 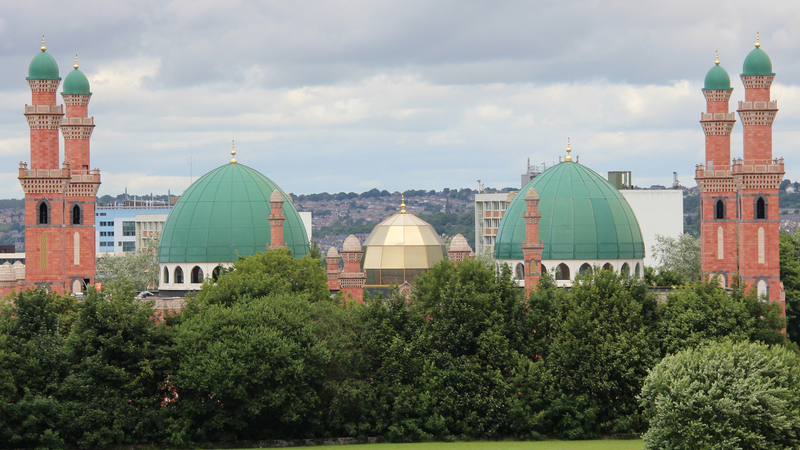 The area where Hazrat Sahib delivers their sermons, and where prayers are lead. 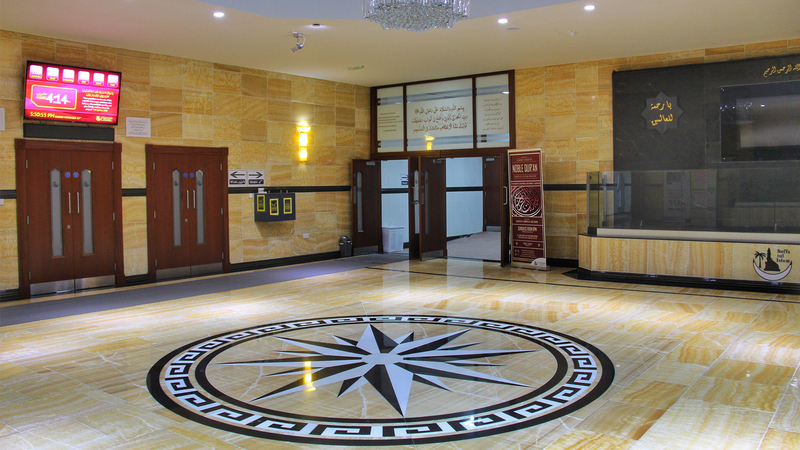 The main foyer area you enter upon passing through the main entrance which then leads into the main prayer hall. 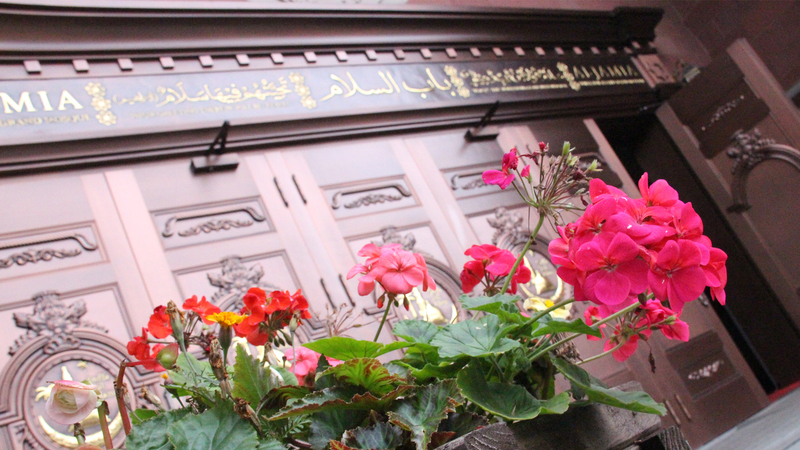 Front of the main hall where sermons are delivered and congregations are lead. 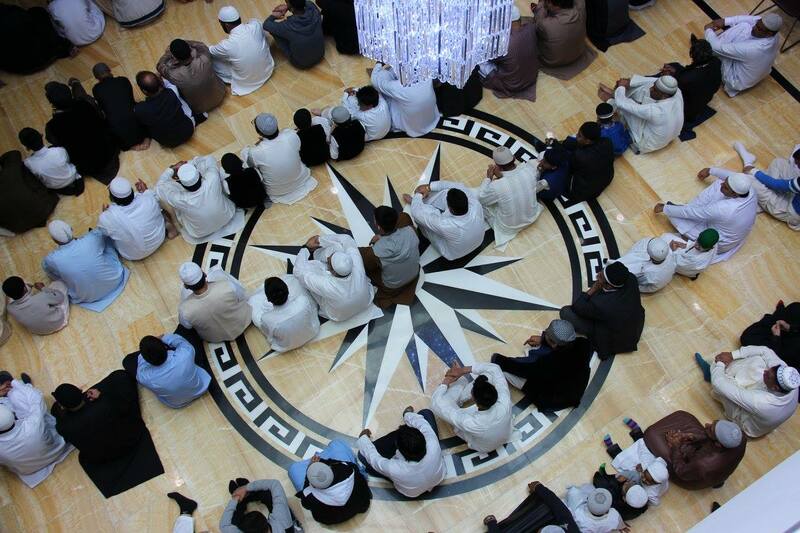 "Allah is the protecting guardian of those who believe he leads out of the darkness into the light. 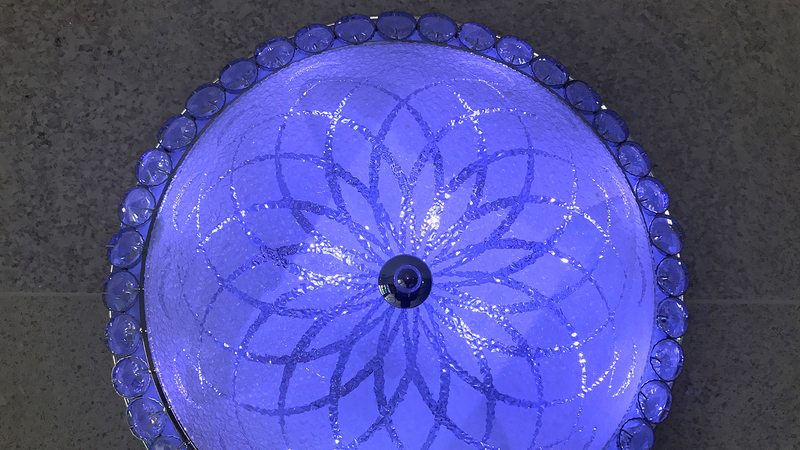 [Al-Baqarah 2:257]"
Night time view of the chandelier in the foyer area looking up towards the dome. 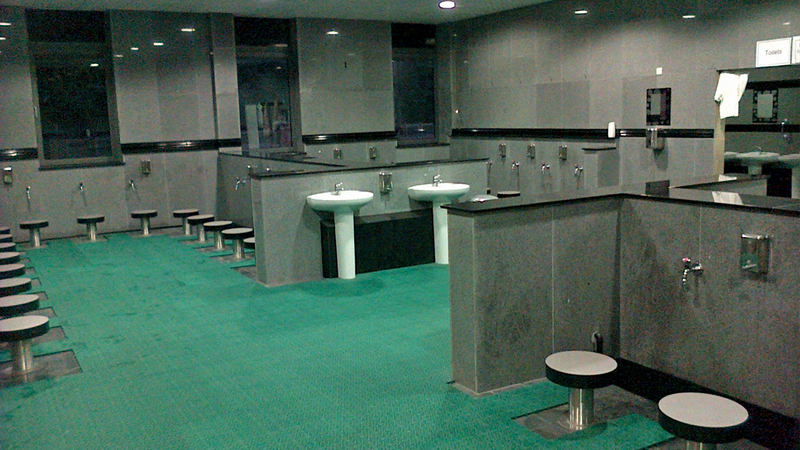 A view of the modern ablution area with showers, toilets and cleansing areas. 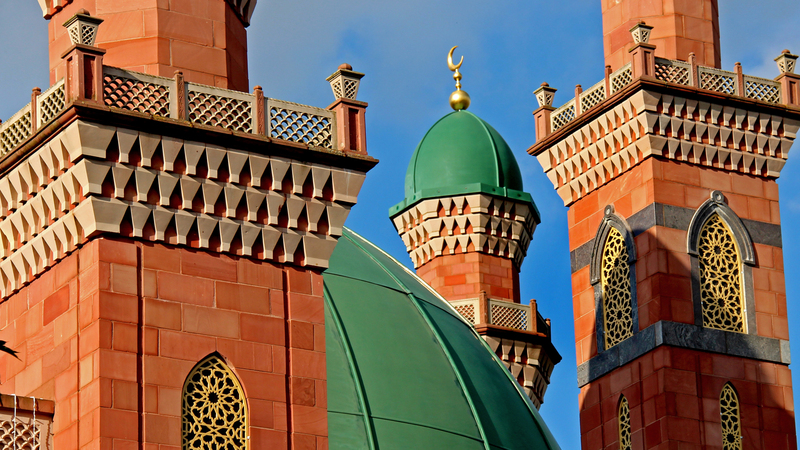 Exterior view of the minarets and a general side-on angle of the masjid. 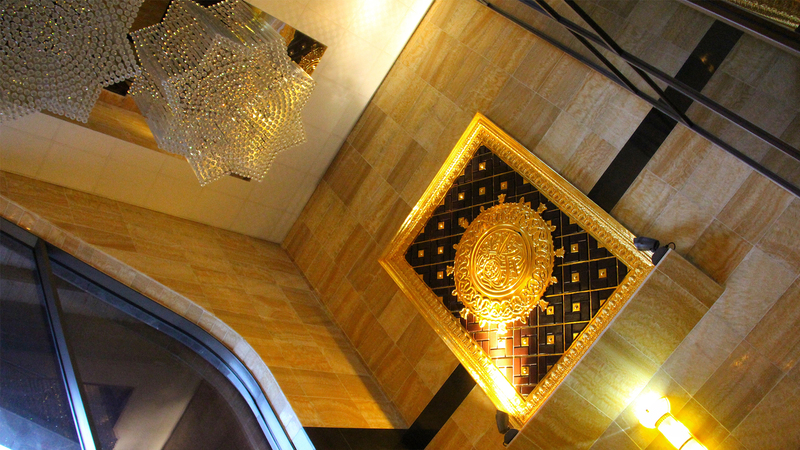 A view of the gold frame structure of the dome. 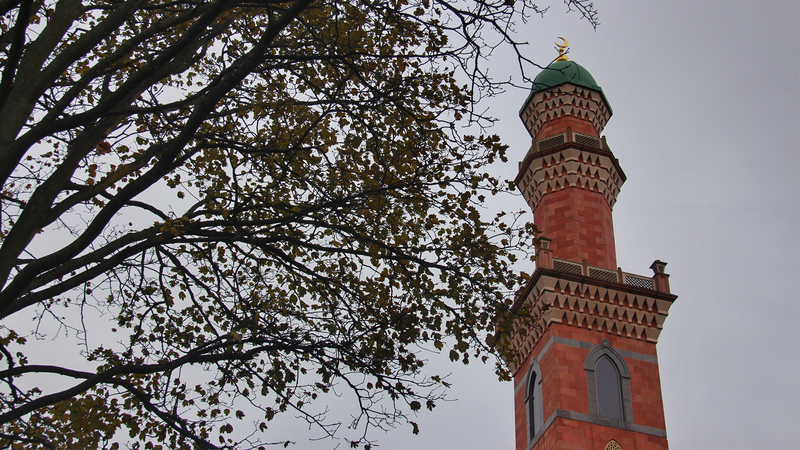 Upper section of the minaret. 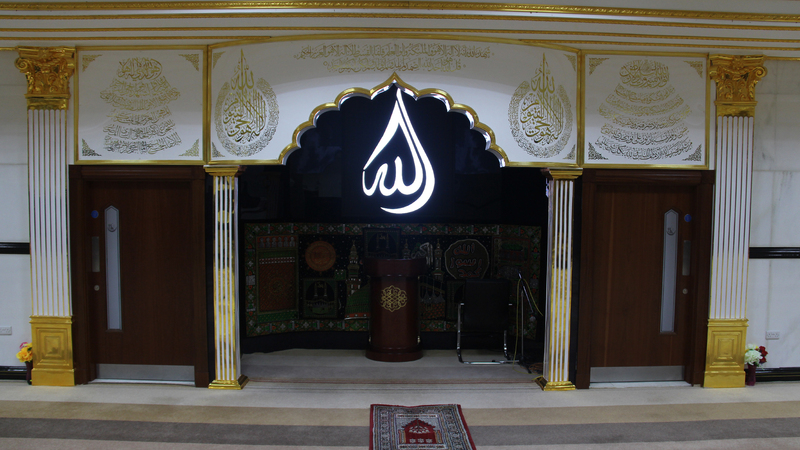 Here is a picture of the Grand Mosque's side entrance. 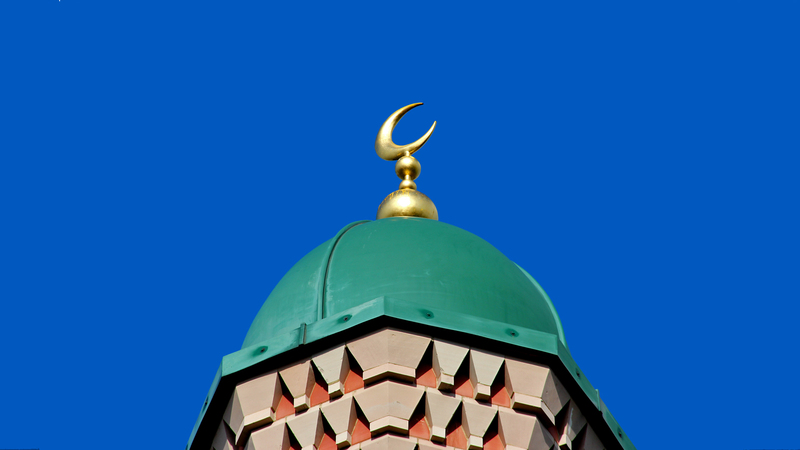 One of the minarets constructed. 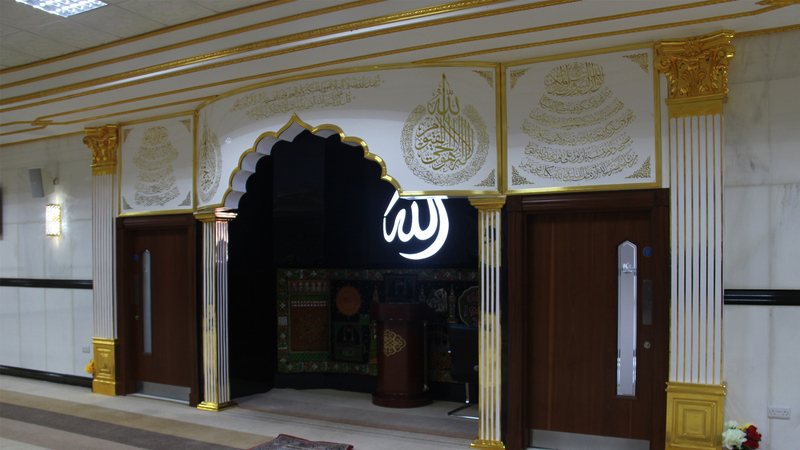 An image showing the main entrance of the masjid. 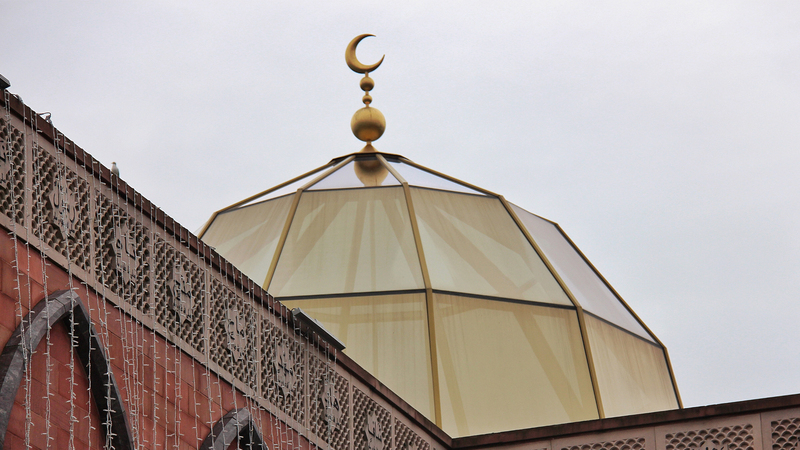 One of the many domes found on the top of the masjid. 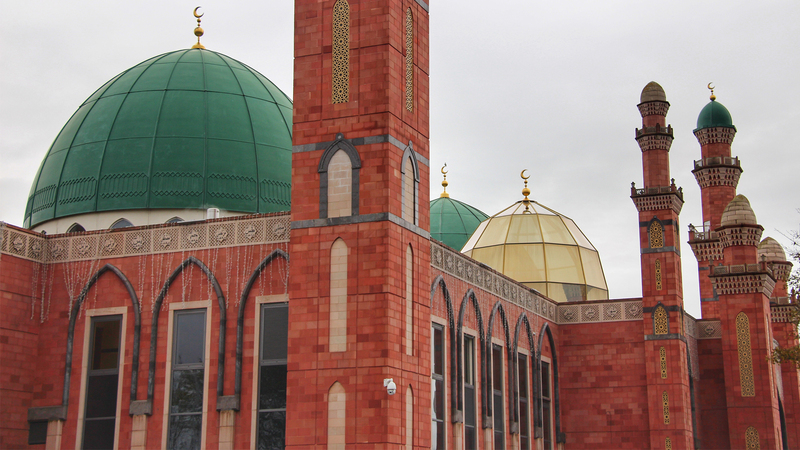 A side angle of an exterior view of the masjid. 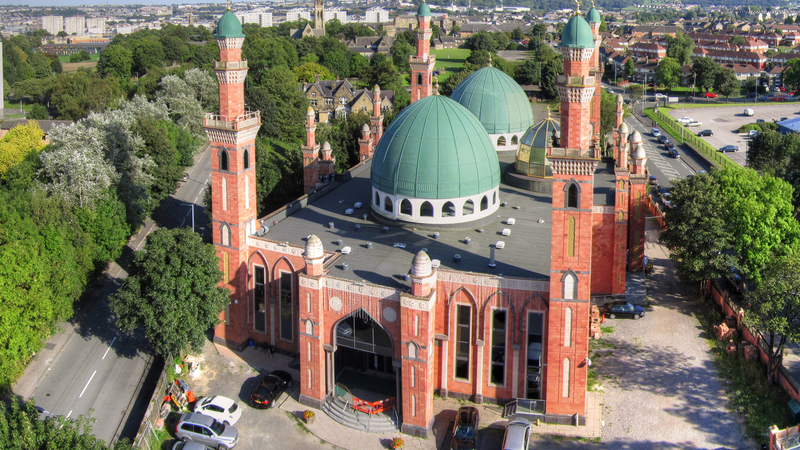 Aerial view of the masjid. 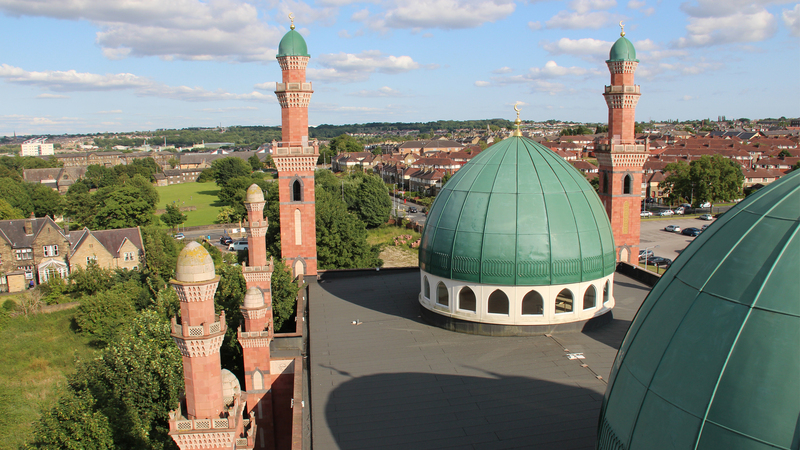 A POV angle from one of the minarets. 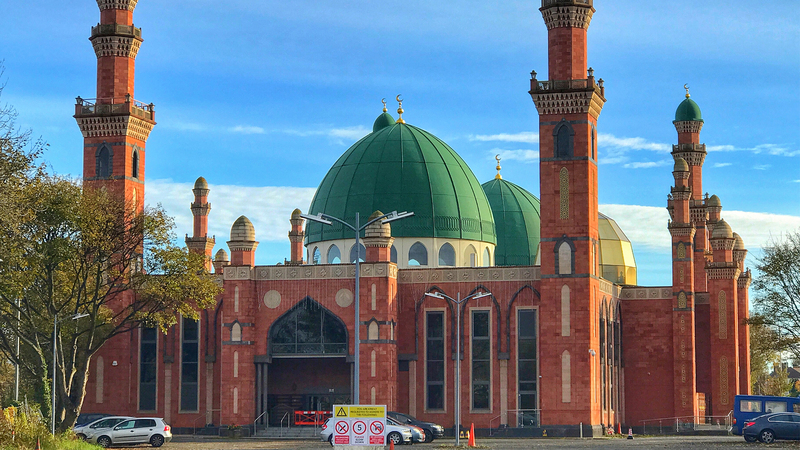 A view o the side entrance of the mosque, towards All Saints Road. 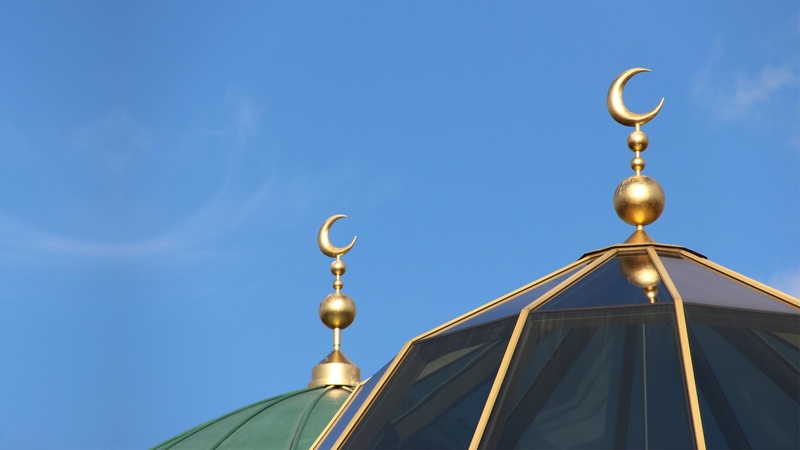 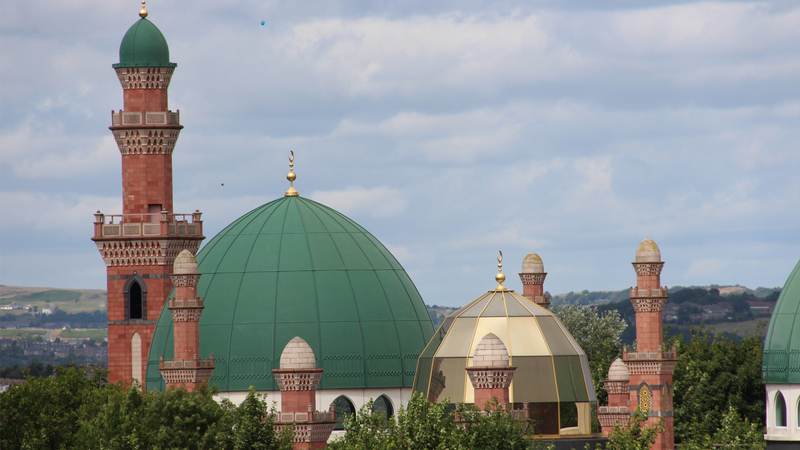 An image capturing two minarets and two of the domes. 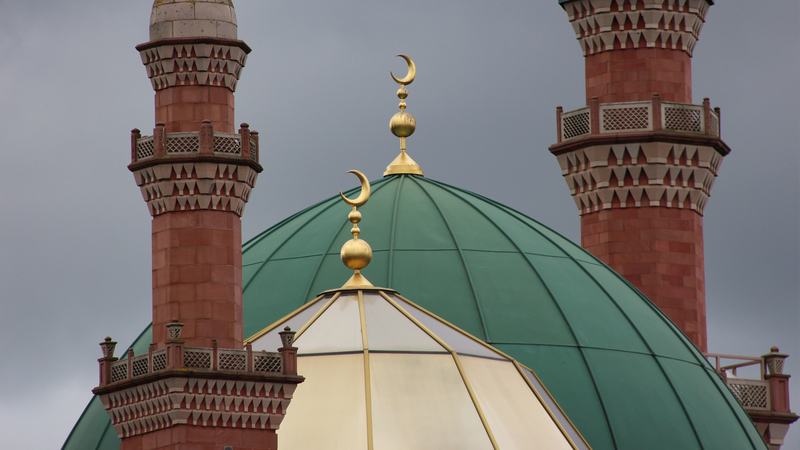 Another view of the minarets and domes. 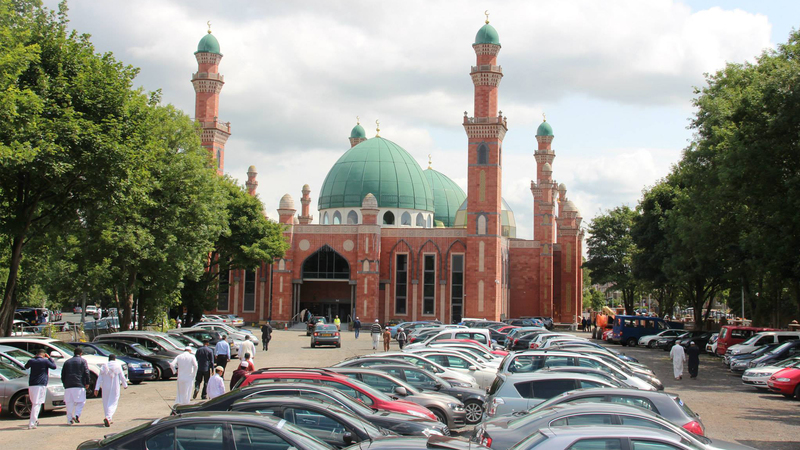 Here is a picture of the Grand Mosque completed in terms of its exterior construction, with worshippers gathering to pray at Al-Jamia. 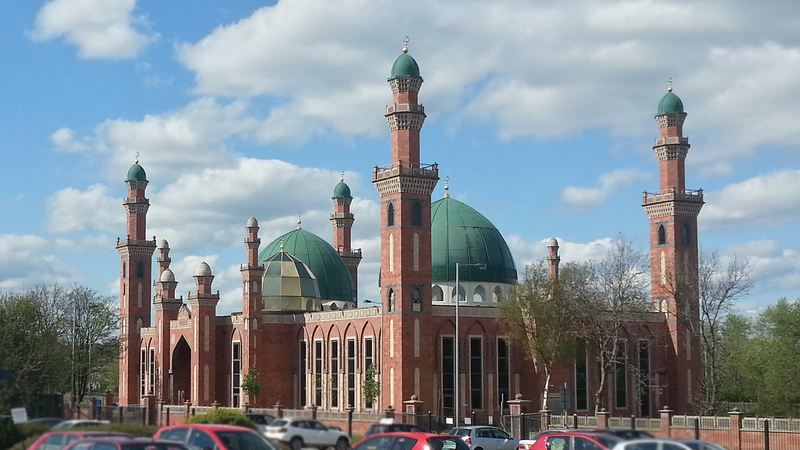 Here is a picture of the Grand Mosque completed in terms of its exterior construction. 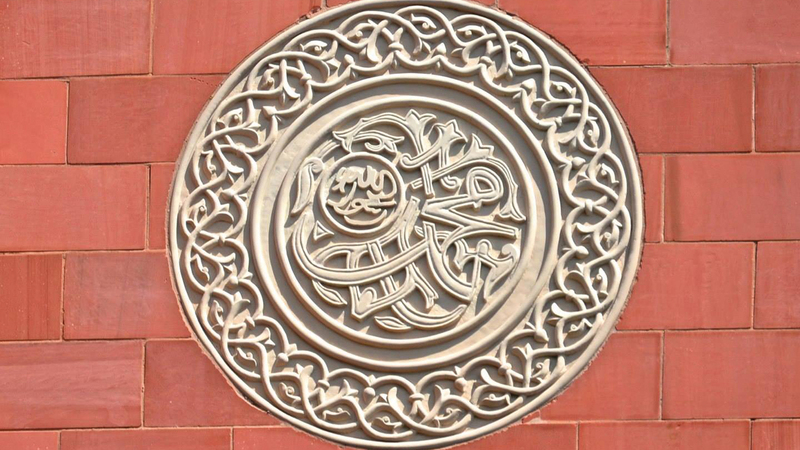 Here is a picture of the fine stone works found on the exterior of the masjid. 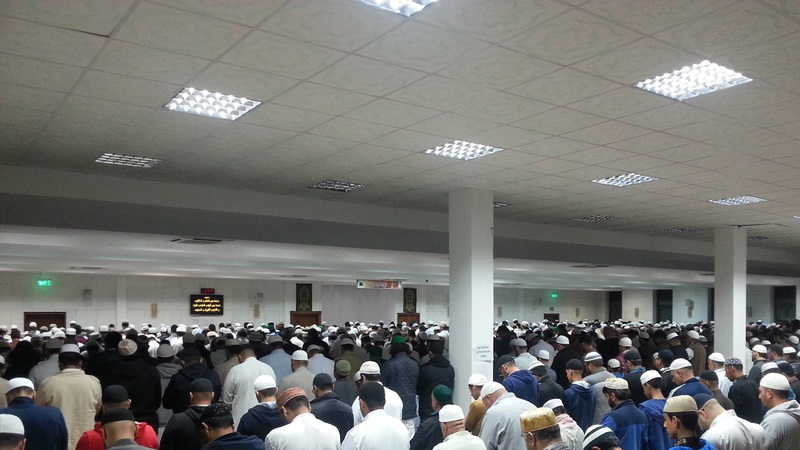 Read your congregational eid prayer at Al-Jamia with some of the largest attendances. 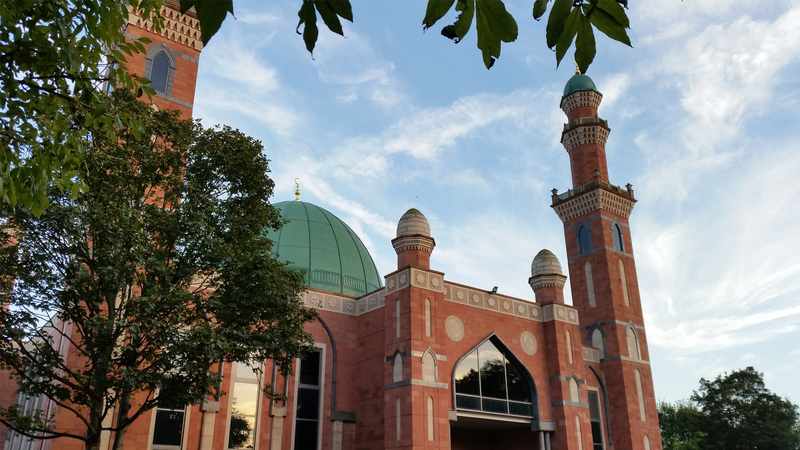 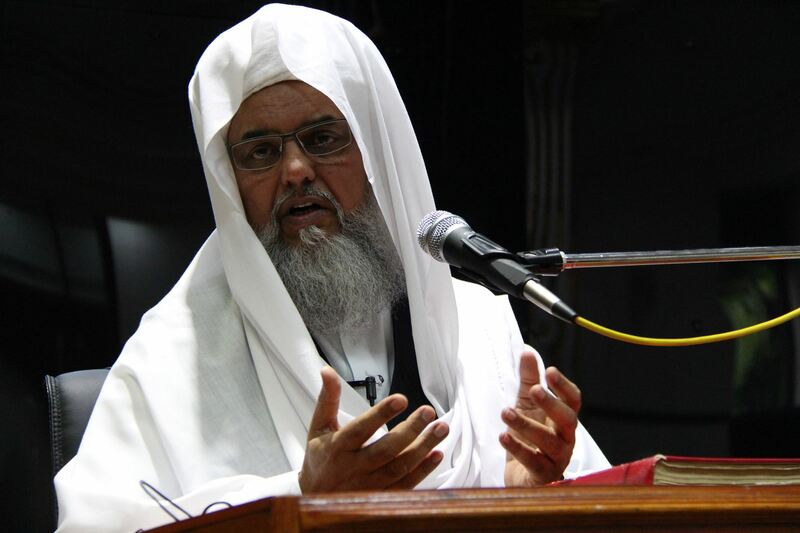 Stories from the life of the great saint and lessons from his teachings were delivered eloquently by the orators who also narrated some of his many miracles and recounted his unwavering steadfastness to the Qur’an and Sunnah. 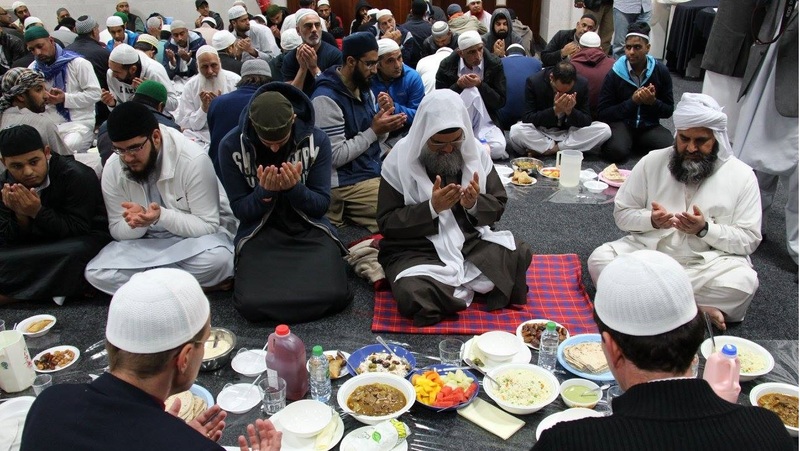 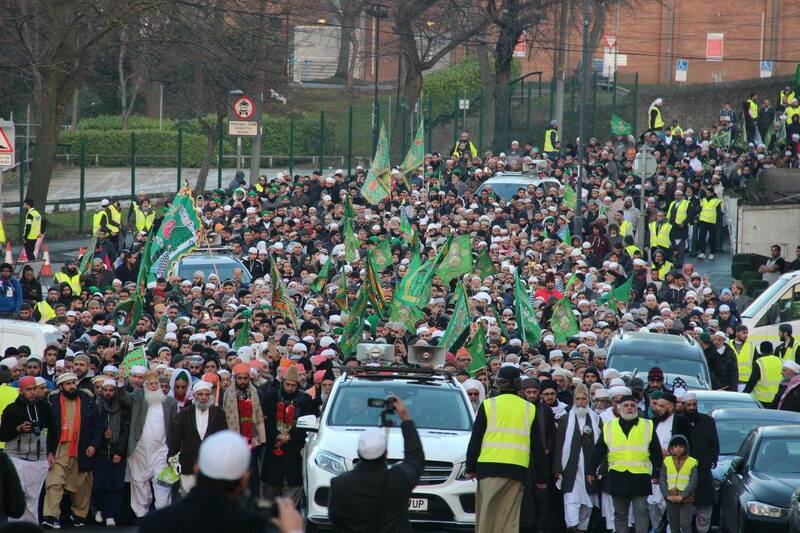 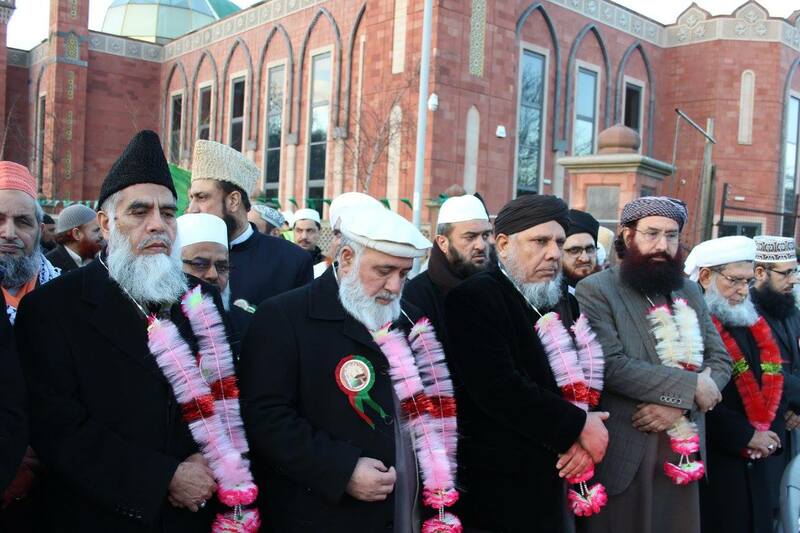 Some of the leading scholars in the region gather at Bradford Grand Mosque to carry out and lead the procession. 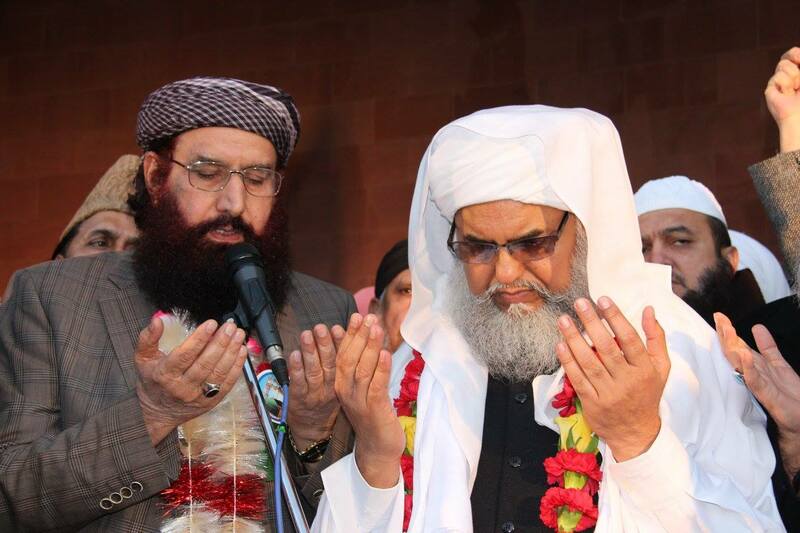 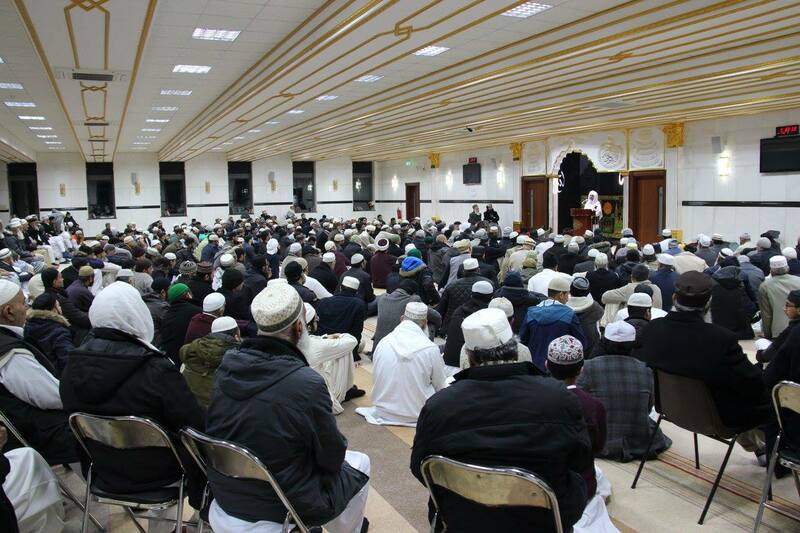 Hazrat Sahib delivers a dua proceeding the juloos.